The hair transplant procedure involves the extraction of hair follicles from the donor site like the back of the scalp to a hairless recipient site. Individual follicles are plucked by a refined extracting technique. These follicles are then implanted to the bald area one by one. 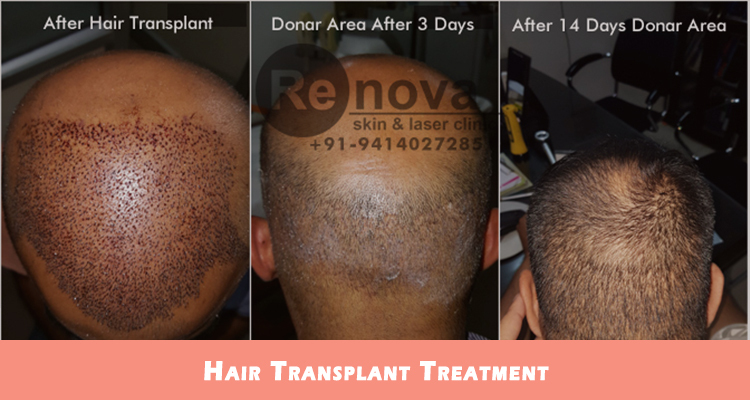 At Renova skin clinic, the latest and widely FUE method which is a European patented technique is used as compared to FUT which is older. •	No use of a knife or blade makes it an ideal solution for those afraid from scars and cuts. •	This technique has a minimal downtime. •	A day care surgery that doesn’t requires admission. •	It is easy to go, safe and comfortable. Patients can talk as well as being normal while having the transplant. 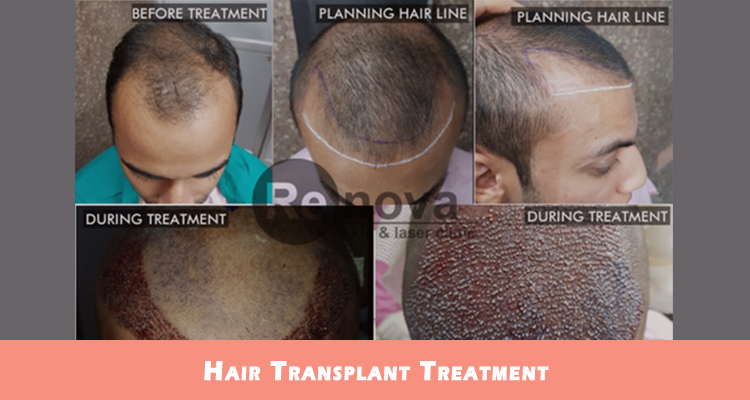 Hair transplant cost varies according to complexity and many factors as every case is different. So we encourage you to book an appointment with Dr. Puneet Goyal to get the right estimation. Will the results be permanent ? Don’t worry, your transplanted hair continue to grow in natural way over your lifetime. So results are permanent. Am I conscious during surgery ? Yes you are conscious during the hair whole transplant procedure as local anesthesia is given that gives painless and comfortable experience. There is no age limit, however it varies case to case and different conditions & factors. Older ones have much higher success ratio as compared to younger ones due to their irregular hair loss pattern behaviors. How long will I need to rest and when I can go to work ? Generally, you can go to work in next day without any rest but avoid exercising or Gyms or any sexual activity for 10 to 15 days. Keep your body easy going and relax during these days. Will I look natural ? Yes, after hair transplant it will look completely natural. It is a safe surgical procedure to help regain your hair. a)	The number of grafts being implanted: Each graft may have about 1-5 hair strands. These grafts are implanted during the surgery. The time will depend on the patient baldness also. b)	The type of surgery followed: There are two types of surgery one is FUE (Follicular Unit Extraction) and Follicular/Strip Unit Transplant. FUE is extraction of graft and the time will depend on the experience of the skilled team. FUT deals into the extracting hair grafts from scalp strip. It usually takes about 4-6 hours in this process. Not as such. The pain is just like a prick of the needle. Local anesthesia is used where the transplant will be carried. So the pain may occur at two points one at the time of the anesthetic prick and second is when the grafts are injected. The anesthesia minimizes the pain and the speed of injecting is low as it goes only skin deep. After the procedure, the patient is given a painkiller that too in the case of FUT Technique. What are the potential side effects of Hair Transplant ? •	Swelling: Depends on the patient as well as the surgeon. •	Boils: Boils may appear at the point of extraction and transplant. They settle after a few days and do not need medications. •	Shock Loss: Sometimes after the implant at the site where you had some hair, you may face hair loss. This is called Shock Loss. Ultimately, it will stop after some time. •	Linear Scar (in case of FUT). Who are rejected for Hair Transplant ? a)	Person who have extensive hair loss. They may not have sufficient hair extraction to cover the baldness. b)	Anyone who has hair thinning but still have dense hair. c)	Candidates who suffer with Alopecia Areata which makes the transplant pointless. d)	Candidates who have Diffuse Hair Loss that may arise as the side effect of any illness or disease. a)	Hair should be washed at least 2 days before the transplant. b)	Avoid drugs or antibiotics at least one week before. c)	No supplements of Vitamins and a big no to smoking or alcohol at least 7 days before. •	Eating vitamins, minerals and nutrients supplements as prescribed. •	Washing hair with the medicated shampoo as prescribed by the doctor. •	Do not go for a direct shower for about a week. You may notice that within 2-3 weeks the transplanted hair will fall. Gradually in about few months you will observe the growth of new hair. Yes, you can wash your hair after the treatment but wait for three days. And after this use the medicated shampoo to clean the scalp and area of transplant. How many treatment sessions will I need ? It depends on the baldness of the patient as it decides the grafts that will be used to implant. The treatment sessions will also depend on the procedure opted for implant. Like FUT can benefit the patient in just one session. Yes, the hair transplant is used in both men and women. It just depends on their individual situation that will govern the treatment procedure along with the recovery time. 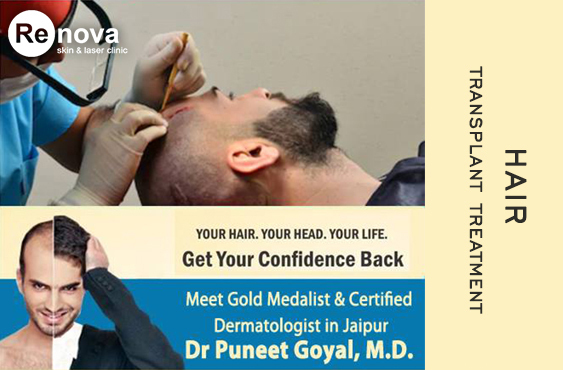 Hair Transplant Surgeon, Puneet Goyal and his staff did an amazing job. 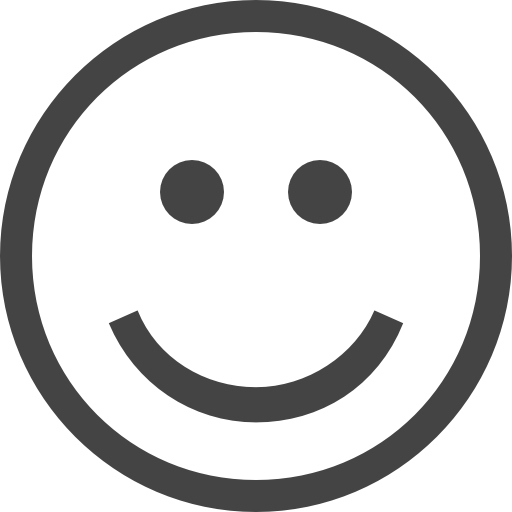 Right from day 1 till end of the procedure, I am satisfied and my results are natural. Dr Puneet is v senior hair transplant surgeon in Jaipur and he met me directly after appointment unlikeother big brands counselors were present and not the surgeon. Secondly OT is good and all latest equipment is available.